5. You would(n't) like it! As I had warned told you back in May, June was indeed a busy month with a bit of travel and a lot of work! We had gone to London for the Memorial Day Weekend, and outfits from #2 to #7 & #10 are from the pictures taken there, which I simply spread through the month as I knew that being in India for the better part of the month I wouldn't have the time or the photographer for the outfit shots (Type A!). Though I did take most of the OOTD pictures using my smart phone. One of the outfits which I didn't click while in London was luckily captured by Susie on her blog (Thanks, again!). Other than that, what I had hoped was an easy-breezy-Sunday-post, ended up becoming a feminist-religious-discussion and disabling comments led to a rather confrontational post. Make Up and Jeans - Guilty Pleasures presents Tanvi! all the outfits are fabulous and its really tough to choose one. I like #1,2 , 8 and 9 more. They are all lovely and very different. I love how versatile your style is. I love how bold 4 is and voted for that. Outfit numero 8 is so classic and chic darling! All fabulous but number six is my favourite. What a fabulously stylish month?! Loving 1 & 9, choices choices eh?! Really hard to pick, but I chose maxinspired! I hace never ventured to wear a dress like this before and I really think it was gorgeous the way you put it together :) oh and the jacket in 10, did I tell you I am in love with tht? ;) great month for u all in all, happy to hear that! Tanvi I got a request :) whenever possible (or if possible) can you do a post on holiday packing which might include sight-seeing, hiking (not sure if you are in to hiking) and travelling comfortably ? No. 1 & No. 10 r my picks. 1. Can't wait to see those glasses. 3. You're looking pretty good girlie! How did I not remember #5? Sparkletastic! June was a great month in the sense of outfits! love it! 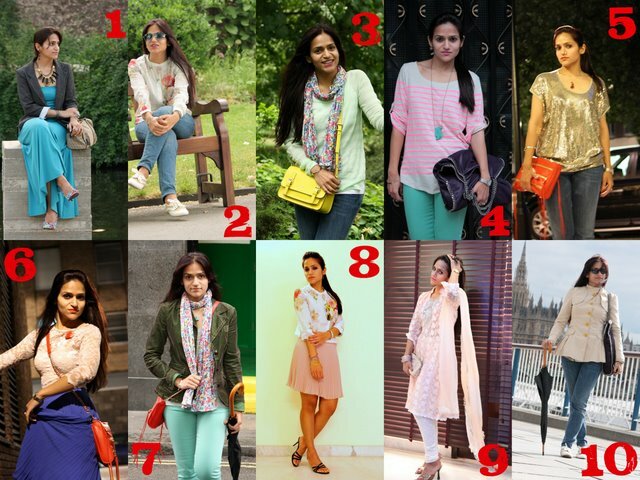 Great round up of outfits for the month! You look fantastic in them all. I love number's 5 and 8 the most. No 9 did it for me. Can't get past the fabulousness of it. 4 is my fav by far! I love them all. It's not the clothes it's the girl! i love love LOVE #4 and #6, although all are smashingly stylish. seriously. you look fabulous! june was a good month. This is such a hard choice because I adore so many of these outfits. Overall I'd go for outfit 6 although 10 is a close second. Love that coat. 'Right to think' will always be my pick because the topic you chose is very close to my heart.I feel pretty strongly about it.Besides,the very blue skirt and the sling were gorgeous!Add to it,your lovely red lips and the top/dress and I'm sold!